This is the second of a three part series on authentic listening, theater companies who do it, and how empathy can change the way we interact with our audience and other artists. You can read part one here. Theater people frequently lament lagging box office numbers and an aging audience that only supports the largest institutions. There’s talk that we must do something drastic to sustain our future. Lately, I’ve been thinking a lot about audience. Who are they and why are they waning? The solution to salvation may not be as drastic as some think. Ten years ago, Vampire Cowboys figured out the formula. A self-proclaimed “Geek Theater” company lead by playwright Qui Nguyen and director Robert Ross Parker, VC did two things. They followed their hearts, and they listened to their audience. Before VC, over-the-top, camp antics like cross dressing, wacky puppetry and goofy pop-culture references were relegated to cabarets and drag clubs. Certainly, theaters from the 1990’s like Collective Unconscious, Surf Reality and Todo Con Nada paved the way for VC to explore fringe theatrical devices. But, VC didn’t just create avant-garde passion projects for tiny downtown venues, nor did they try to fit their square-peg-style into a round theater community’s fashion. They aimed to cultivate a vast audience over the entertainment industry at large. 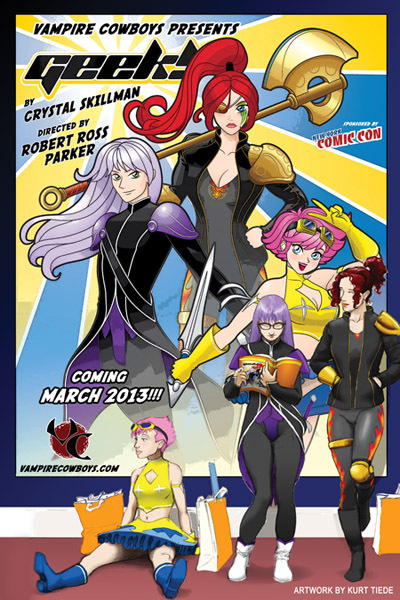 Vampire Cowboys was the first theater company to have an official sponsorship with ComicCon. For several years, these Geek Theater makers have manned a booth at the New York arm of the convention, offering live fight performances from their productions. Obviously, the increase in popularity of ComicCon paralleling VC’s inception is fortuitous, but the important point is they seized this opportunity and grew to cultivate loyal fans, as well as becoming critical favorites. Another fantastic (now retired) program that VC offered was The Saturday Night Saloon. Again, building on the downtown theater models of the 90’s, VC created a monthly-serialized theater event that brought together some of the best up-and-coming playwrights, like Crystal Skillman and Mac Rogers. It also offered a regular home for actors and fans to get to know each other in an intimate setting. By involving these actors and playwrights, they expanded their talent pool and encouraged those artists’ inner geeks. Last season, Mac Roger’s theater company, Gideon Productions, produced his Honeycomb Trilogy – Advance Man, Blast Radius and Sovereign. It is an epic, science fiction tale about an alien invasion on Earth, the resistance and their rebuilding. The trilogy was ambitious, and ten years ago, it might have been a recipe for disaster. But Gideon learned from VC, skirted traditional theater press, and reached out to the science fiction community. They received accolades from tor.com and io9.com, which filled their houses with fellow sci-fi geeks. The productions’ success attracted the New York Times, which gave the trilogy’s final installation a rave. They also joined VC at ComicCon this fall, presenting Kill Shakespeare: The Live Stage Reading, based on the successful IDW Publishing comic book series. Also last season, Flux Theatre Ensemble teamed up with Gideon Productions, forming an alliance with Boomerang Theater Company called BFG Collective. The three companies took over The Secret Theatre in Long Island City for six months, to disperse production costs. Flux produced August Schulenburg’s Deinde, a science fiction play about the rise of the singularity. Tomorrow, they open Adam Szymkowicz’s superhero noir comedy, Hearts Like Fists. Next week, terraNOVA Collective, where I served as associate artistic director for eight years, also opens a comic-inspired play, Robert Askins’ P.S. 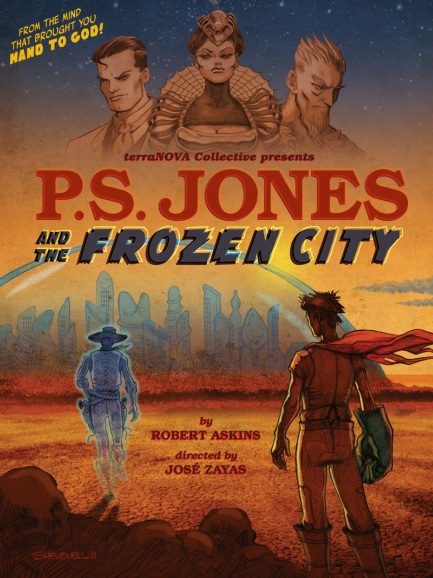 Jones and the Frozen City. I saw a workshop of the play earlier this year. It’s filled with wild puppets and fabulous costumes in a far out dystopian future. It’s gonna be loads of fun. Finally, Vampire Cowboys returns for their 10th anniversary season. For the first time, the main stage play won’t be written by its co-artistic director and resident playwright, Qui Nguyen. In March 2013, they’ll mount the appropriately titled Geek! by Saturday Night Saloon alum, Crystal Skillman. 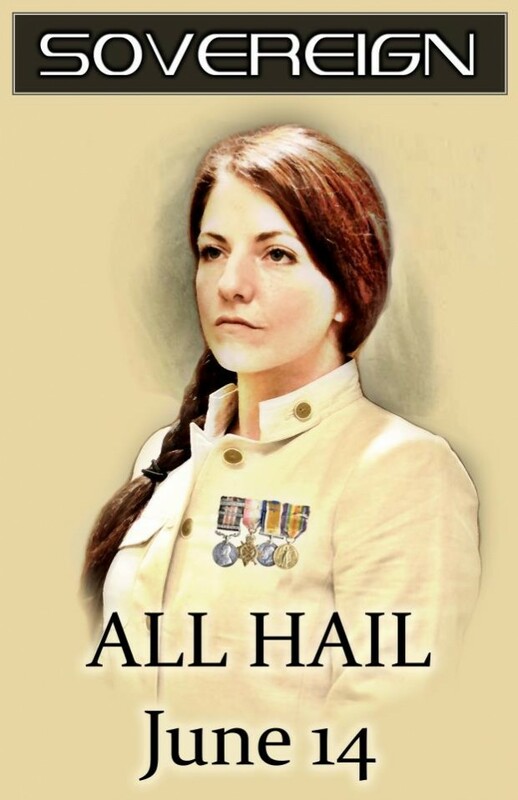 I also enjoyed a reading of this play earlier in the year, and it’s full of stage fights and geeky girl power. It may come as no surprise that all of these theater companies have dipped toes or dove into the deep end of transmedia storytelling. Vampire Cowboys has a long history of creating online videos that tie into their shows. Flux Theatre Ensemble and Gideon Productions have used video blogs, news conferences, and pamphlets. And, terraNOVA Collective used video, written blogs, and Twitter for my play, Feeder: A Love Story. Is the theater market becoming overrun with Geek Theater? Can it sustain the influx of zombies, super heroes and sci-fi dystopian futures? Short answers: No and yes. There are only a handful of groups creating this kind of theater in a massive market, and there should be room for everyone to play in the same sandbox. However, it only works if they remember to stay true their hearts and listen to their audiences. When creators authentically listen, they lay the foundation for a long conversation with a dedicated and engaged audience. It can’t just be about the next box office transaction. It must be about cultivating a sincere relationship. If large institutions are going to thrive in an ever-changing digital landscape, these are the values they, too, must embrace. Tomorrow, I will conclude this series featuring another panel from the Futures of Entertainment 6, focusing on empathy and listening. Fascinating trend of which I was not aware! Love the innovation and the companies’ ability to adapt their content to an audience with willing ears. I’m so glad I came across this! This got me thinking about who I write for (a good thing), and I came up with my own answers on my blog. Great to see you thinking about who your audience is. It’s an obstacle for many writers, especially in theater. Figuring out your audience gives clarity to your target. Fish where there are fishes.